Can you hear the roaring of motors? The deafening cheer of the masses? The squeaking of the tires? Then you are at Ondarun Tournament. 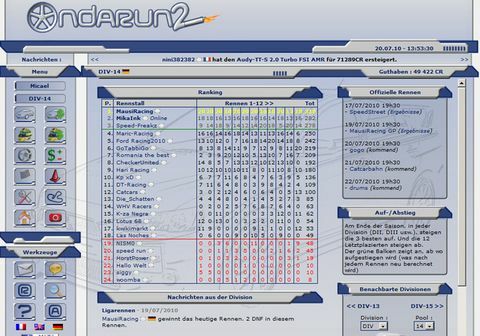 The free to play race car manager browser game at POPMOG. You take over a leading role in a brand new racing team. From now on you are in charge of the training of your drivers, the management of your cars and the expansion of your race tracks. Furthermore the rides have to be checked, repaired and also tuned. And don’t forget to check out your used car dealer, because here other players are trying to get rid of their used parts and sometimes you can make some quite hot deals. Challenges of competitiveness are waiting for you continuously. You have to take care of the state of your race cars, the shape of your race drivers and the condition of your competitors. But of course you always have to keep an eye on your finances. Your drivers are fired up for their commitment and you have to prepare them well for the races. After all you don’t want to ride on slicks in winter, do you? Subscribe to different cups and earn some popular awards and money. The cash you can simply put into more talented drivers and faster cars. If you do well you soon will have made yourself a name in the scene and the crowds will swarm to your races. And that really pays off with the ticket prices. Can you smell the taste of money? And who knows. Maybe you are going to win the world cup. Can you take the challenge? Are you ready to carry the responsibility to lead a whole racing team? Think of the fast cars, money, glory and fame. Become the best of the best at this race car manager browser game at POPMOG and be the first who passes the checkered flag. Of course it’s free to play - as all online games at POPMOG! 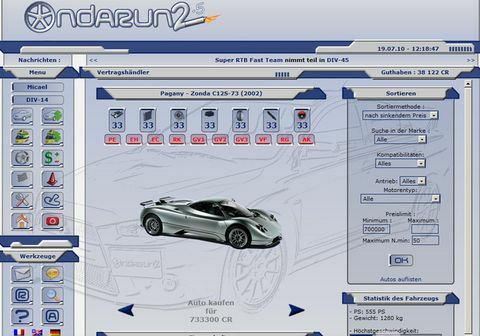 You’ll find all that you liked about Ondarun2 in this race-car online game. Only this time with more cars, more drivers, more divisions, more races, more tracks…and more of everything!